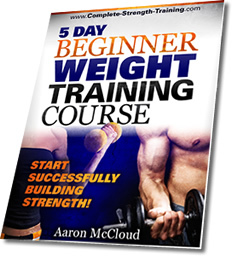 These five strength training ebooks actually helped me to build muscle and strength. I read them, saw the inspiration and logic there, actually applied it to my own routines, and got great results. I say 'actually helped' since there's a ton of garbage on the web, and I've read tons of strength training ebooks. Most of the authors just rehash old material, and have their eyes on a quick buck. To say that I've been underwhelmed many times would be, oh, an epic understatement. If I had to go through the books again, these are the only ones I'd fork over cash for. At around $10 each, I hope this'll save you time and money. 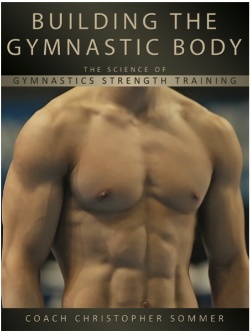 If you're interested in bodyweight conditioning, but don't know what you're doing… get this book. It details a full battery of bodyweight exercises, with photos, pointers for correct form, and details for how to progress from the easier exercises to more advanced ones. Now, if you've never lifted or done any bodyweight work, many of these exercises will be beyond you. They're easier to start with a baseline level of some strength. But of course, anything in the beginning is difficult. And after that, the next step is the next most difficult part. But this book details an entire program that will serve you for several years, if you're that dedicated. I think it's a great investment of about $30 for this strength training ebook. 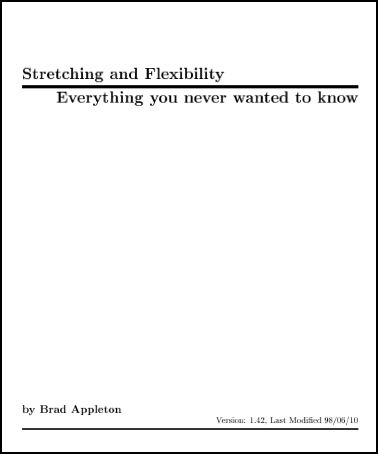 This is a brilliant ebook about stretching and flexibility, bringing in a lot of advanced stretching techniques. oh, and best of all - IT'S FREE! Check out Brad's Website too. It has lots of information about stretching, and background about the book. Now, this book doesn't give you photos of stretches to perform. But it does give you a lot of theory and information about your muscles and ligaments, and how to stretch correctly. And let's face it, you can find photos of different stretches all over the web. So, for the low price of nothing, it's a pretty sweet book that will compliment your other strength training ebooks. Seriously though, I think this ebook gives you an excellent start on how to do strength training. It doesn't detail exercises for you since, frankly, you can find details of what correct form for virtually any exercise is online. But, this gives you valuable information for designing a workout program. You can design a program that actually works, with the right ratio of working out to resting, and set yourself up for success if you've never workout out before. Starting Strength is *the* bible for barbell training. Rippetoe only goes over 7 fundamental exercises in the 347 pages of this book (and a few supplementary exercises), but he covers then in exacting detail, with vivid descriptions, and details all the biomechanics and body information you could possibly want. If you intend to practice barbell training, get this - of all the strength training ebooks. The Kindle version is only $9.99, making it a great investment for a classic resource on effective barbell training. Rippetoe's companion book is Practical Programming for Strength Training, which focuses on organizing lifting programs. Check it out too! Body By Science may be the last one on this list, but it's one of the best modern book on lifting with HIIT. High Intensity Interval Training (HIIT) focuses on pushing you to train as hard as possible for a brief period of time, then taking a week or so off to recover and grow muscle. Little and McGuff also give you lots of interesting science to back up their training method. If you're looking to get the most muscle for your time spent training, read Body By Science. • Click here to leave '5 Strength Training EBooks I like Most' & go back to the Home-page!